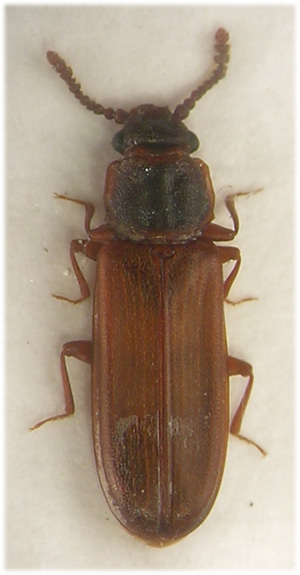 Pediacus dermestoides Represented in Britain by two species of Pediacus Shuckard; P.depressus (Hbst.) and P.dermestoides (Fab.). These are superficially similar and very distinctive species; small 3.5-4.5mm (Joy) elongate and dorsoventrally flattened with parallel sided elytra and dentate lateral margins to the pronotum. Antennae robust and relatively short, inserted on side margin of head behind mandibles. Eleven segmented; basal segment large and broad, 2, 4 and 5 quadrate, 3 elongate, 6 and 8 transverse and small which makes segment 7, which is transverse but much wider, appear disproportionally large, 9-11 form an elongate club. Head triangular, broadest at prominent and very convex eyes which are mounted near the basal margin, temples short and strongly contracted to a short and broad neck. Pronotum quadrate or transverse, surface flat with distinct depressions; two towards anterior margin and two in basal half, bordered and toothed laterally. Scutellum transverse. Elytra strongly flattened, depressed either side of the suture so that they appear concave, parallel sided with apex rounded and completely covering abdomen. Margin bordered and narrowly explanate at middle, gently sinuate in side view. Variously punctured (se below) and very finely pubescent. Sutural stria well impressed from apex becoming evanescent in basal quarter, not reaching basal margin, there may be traces of other striae or a tendency towards serial puncturation (see below). Femora robust, tibiae and tarsi long and slender. Tarsi in male 5-5-4, female 5-5-5, first segment very small, terminal segment long and slender. Strongly transverse in dermestoides (about 3:4), quadrate or very nearly so in depressus. In dermestoides the hind angles form a very distinct and sharp tooth while the tooth at the centre of the lateral margin is small, blunt or represented only by an indistinctly angled sinuation. In depressus the hind angle is represented by a small and blunt tooth while the central lateral tooth is larger, sharper and distinct. In dermestoides there is a more or less triangular area of mederately strong puncturation around the scutellum, otherwise the elytra are impunctate (or at least appear so at X20) and dull, much more so than the relatively shiny forebody. In depressus the elytra are obviously punctate throughout and, in some lights, there are traces of striae. The elytra are usually almost as shiny as the forebody. Both Joy and Fowler mention differences in colour between the species; Joy as a key character: 'Head and thorax much darker than elytra....dermestoides' and 'Head and thorax of about the same colour as elytra....depressus' and Fowler in his descriptions: P.dermestoides 'Thorax... usually dark brown or blackish with edges lighter' and for depressus; 'Thorax...the colour is lighter'. In general both species are drab brown with testaceus appendages and colour is useful only as a guide; a darkened pronotal disc indicates dermestoides but in this species the disc is not always dark, and pale specimens approach the colour of depressus. Both species have in the past been considered as rare or very rare eg Joy gives 'England south to Notts, rare' for dermestoides and 'England south to Yorks, very rare' for depressus while Fowler gives rare for depressus and very rare for dermestoides. The modern understanding is quite different; the NBN map (April 2009) shows lots of modern records throughout southern England north to Yorkshire (including the west country but excluding Wales) for dermestoides while depressus it would seem is a very local species with only a few modern records for the southeast, one from Cheshire ( Alexander mentions one from Carmarthenshire) and an older (pre 1980) record from the Glasgow area. Both are associated with mature and old woodland and wooded pasture, occurring under the bark of a range of both broadleaved and coniferous trees in various stages of decay. The following habitats have been recorded for depressus ; felled pine sap, fungus on pine logs, mould-like fungus on logs, 'Fir' bark, Cossus (Goat moth) burrows and it is stated that oozing sap from any tree is liable to attract any species (Allen, 1956). Larvae feed on other insects (Alexander); Fowler mentions a record of the larva of dermestoides being parasitic on the larvae of Tomicus stenographus, while the adults are fungivorous. A description of the larvae of dermestoides, quoted in some detail, is given in Fowler. Adults are sometimes found in groups of up to perhaps a dozen individuals with many lying side by side under bark. Hurka states that all species of Pediacus live under bark of broadleaved trees but only rarely on conifers (contrary to our experience) and that the adults fly in the evening.